Not to be confused with the color patterns on many bird eggs. 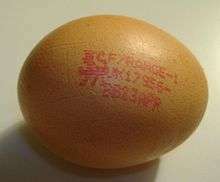 Egg marking is a form of egg labeling that includes an egg code stamped on the egg itself. In the EU there is a producer code regulated by law since 2004. It allows consumers to distinguish free range eggs and organic farming eggs from the industrial caged hen production. 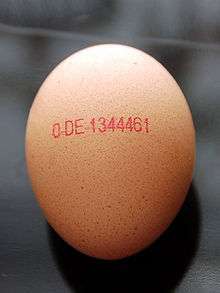 An egg mark may contain a number of information parts - in the EU only the producer code is required. Additional information may be printed along with the date of production being the most common to find. Other information may contain the method of production especially in the non-EU world where the numbered levels do not apply. Note that egg labeling is used worldwide but mostly in the form of egg carton labels. In most countries there are legal definitions on the designation of the egg size, production method, packager identification and best-before dates. As there is more space on the carton there has been no tendency to create an egg code that is seen on the stamps used for egg marking. The egg stamp is required in the EU on all class A eggs unless these are sold directly on the farm. The first number of the egg code defines four levels of production quality in decreasing order - the requirements on organic farming eggs extend on the requirements of free range eggs. caged: this had a requirement of 550 cm² minimum space per hen. However the EU has banned battery cages by 2012 through an update of EC Directive 1999/74/EC. The new minimum is 750 cm² in furnished cages. indoor: the minimum space per hen is increased to 1100 cm² (or 9 hens per square meter). No cages are allowed and instead the hens may sit on an elevated porch in large barn that has a floor covered with sawdust or better. free-range: in addition to the barn (with 1100 cm² indoor space per hen) there must be an outdoor space for the hens with continuous daytime access. There is a minimum of 4 m² of outdoor space per hen. organic: the indoor space is increased to 1667 cm² (or 6 hens per square meter); the available outdoor space has a minimum of 4 m² with grown pasture for the poultry, and the remaining food must come from organic production. Note that a producer with multiple barns will have to register each barn separately. There have been multiple occurrences of the producer code being forged - a common concept is to have multiple barns on the same farm with some having efficient caged hen production and one with an organic egg production code. Eggs are then silently moved to the other barn giving an egg code as if they were from organic production allowing for a higher price on the market. In Lower Saxony (Germany) the state attorney has accused 150 farmers in a year. Organic certification – organic products must bear a registration number that allows to trace back the ingredients. ↑ "Eggs: trade regulations". Department for Environment, Food & Rural Affairs (United Kingdom). 2012-10-08. Retrieved 2013-04-05. ↑ "REGULATION (EC) No 589/2008 laying down detailed rules for implementing Council Regulation (EC) No 1234/2007 as regards marketing standards for eggs". 2008-06-23.